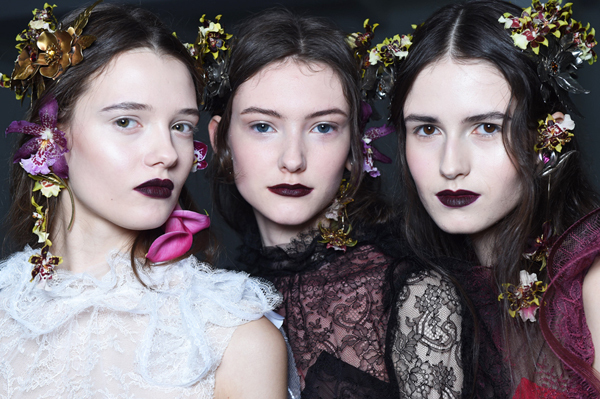 Backstage with NARS Cosmetics at the Rodarte Fall Winter 2016. Oil-Free Moisturizer, NARS skin Total Replenishing Eye Cream, Velvet Matte Skin Tint, Radiant Creamy Concealer, Soft Velvet Loose Powder. James Kaliardos for NARS Cosmetics backstage at Rodarte Fall Winter 2016. New York Fashion Week. (FAIR SKIN MODELS): 413 BLKR Illuminator , Miss Liberty Highlighting Blush, Deep rose side of Paloma Contour Blush. CHEEKS (DEEPER SKIN MODELS): Satellite of Love Highlighting Blush , Deep rose side of Paloma Contour Blush. Eyeshadow (New for Fall 2016, for now Reckless Highlighting Blush), Las Pozas Velvet Eyeliner (New for Fall 2016, for now try Santa Monica Blvd. Larger Than Life Eyeliner. Eyeliner (New for Fall 2016, for now try Santa Monica Blvd. Larger Than Life Eyeliner.